- TV listings were temporarily unavailable for a few days, as the API they used was discontinued. - TV listings have now been reinstated using a different method to acquire the program data. - TV station logos are no longer displayed. - Anyone using this channel before the upgrade to version 2.5 will have to re-select their TV provider, and set up their favorite channels again. - The TV listings were not working for a few days due to changes in the TV listings source data. This has been fixed. - The movie trailers would not always play due to the way Roku handles video from an "https" source. This has been fixed. 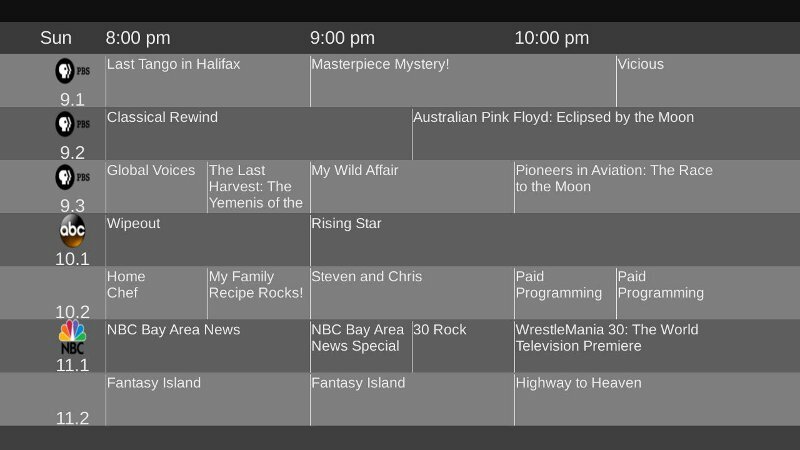 TV listings are displayed on a grid, which contains a user-configurable number of rows. The font size varies with the number of rows, so you can choose between having a more readable display or more TV channels shown. Movie Listings are displayed for a number of movie theaters located near your zip code. 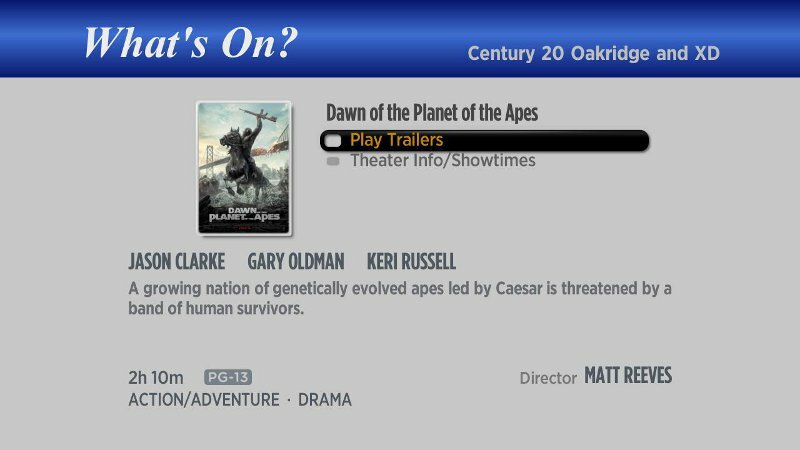 Select a theater to see a list of movies and showtimes. 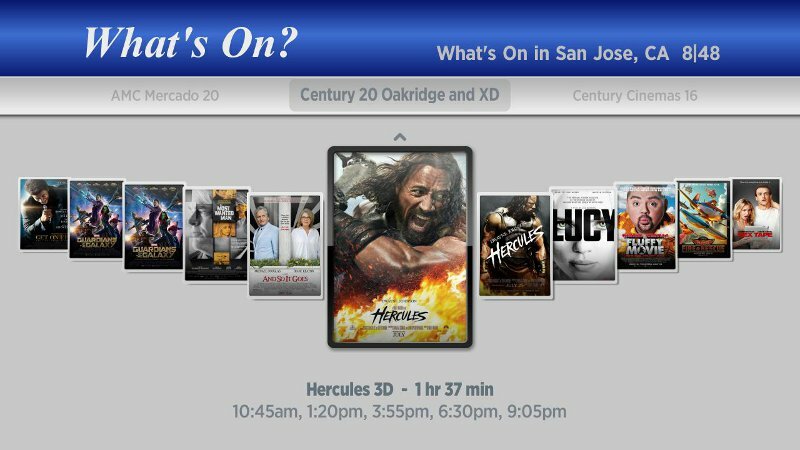 Select a movie to get movie details, showtimes and trailers. Use the forward and back buttons (">" and "<") to navigate through the movie list. Send a PM to belltown with any questions, problems, comments or suggestions. Last edited by belltown on Sat Feb 18, 2017 11:44 am, edited 22 times in total. A new version of WHATSONCHANNEL has been released (1.1) (see my updated first post). Most Rokus currently running this channel have already been updated to the new version. If you're still running version 1.0 then to get the new version, enter the Channel Store then exit back to the home screen. Version 1.1 now has TV listings for any zip code, supports Canadian post codes, and is accessible from all Roku regions worldwide. For full instructions see my initial (updated) post. This was a needed channel, thanks. Cut the FIOS cord on 4/2/12. As others have said, very nice and very needed. Problem. about One in 3 clicks gets a 403 server not found error. This happens on both the tv and movie listings. A request for the TV listing would be a button to display a Prime Time listing. There's a new version of WHATSONCHANNEL available: Version 1.2/02. Enter then exit the Channel Store on your Roku and your version will be updated. The Play/Pause key, >|| , now skips forward to the next 'prime time' TV listing (8 pm local time). That was the only unused key on the Roku 1 remote when displaying TV listings. If you PM me your Roku serial number I'll look into the errors you encountered and the approximate time when they occurred. Are you sure it was 403? 403 is an access-denied error, whereas 404 is the file not found error. EDIT: Problem found and fixed with the 403 errors. 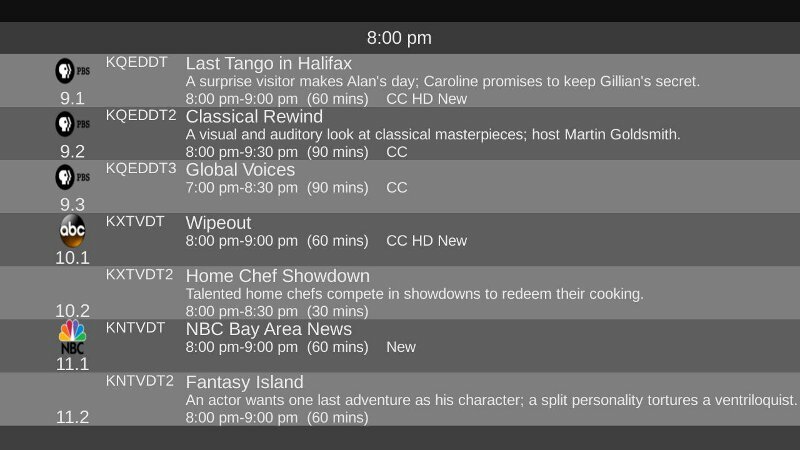 There's now a TV Listings-Favorite Channels option in the latest version of WHATSONCHANNEL (see original post for instructions). You can go to the Settings screen and define which channels you'd like to appear on the Favorites screen. A way to edit channels was all that was missing now What's On is perfect. ^ I agree. Very nice and very handy to have . Is anyone else having problesm with TV listings? I get an error "No TV Listings found." This was working fine until a couple of days ago. I have it set for OTA listings. Movie listing still work. Said goodbye to satellite in 2010 in favor of my Rokus, HTPC & OTA. It's the only way to fly! Member of Amazon Prime & DramaFever since 2011, Hulu Plus since 2010 and Netflix since 2009. Less expensive & better quality entertainment! Re: [Private Channel] What's On: TV Listings Working Again! I've just released an update to WHATSONCHANNEL that addresses the problems mentioned above. The TV listings should be working again, as should the movie trailers. I still need to do more extensive testing, but I wanted to release something as soon as possible as the TV listings had become totally unusable as of a few days ago. Try updating and make sure you're running Version 2.3 or higher. Also, you'll have to re-select your TV provider in the Settings screen and re-enter any favorites as the channel identification information has changed. Let me know (preferably by PM) if you encounter any more problems. Thanks! It's working great now.